AgroDex Decentralized Exchange Platform: Bitagro’s AgroCoin Project? AGROCOIN is an international project aimed at creating a P2P platform, where people and companies can directly credit each other without intermediaries. The application provides the ability to buy and sell agricultural products for Agrocoin, receiving a commission for confirmed transactions. The API provides the ability for any financial institution to use Agrocoin assets as a means of payment. In addition, this API provides third-party large agricultural producers and farmers with the opportunity to label their business and create their own logic of working with it. Agrocoin is a cryptocurrency that will become the means and guarantor of payment between users. This is a sign that will become a tool for the agro-industrial market, with the help of which users of the AgroExchange platform will be able to conduct their transactions on the sale of goods in the agricultural sector. Agrocoin was released by AgroExchange Estonia and is based on the popular and proven Blockchain technology. This is an ERC-20 token based on Ethereum. Agrocoins are available immediately and you can instantly withdraw money to your dedicated address using the META MASK or AgroDex app. Agrocoin allows you to participate in a company’s profit share and buy services and membership on our platforms. Agrocoin guaranteed trading will be available on our cryptocurrency exchange platform immediately after the end of the ICO sale. AgroExchange platform aims to promote the global introduction of Blockchain users among ordinary people through an intuitive and smooth integration of the widely used e-commerce channel using the decentralized payment platform. The AgroExchange web platform is the result of a detailed study of user behavior. Easy registration, super fast KYC, high security and many options for depositing and withdrawing money. AgroExchange is a guarantor of transactions between end users using Blockchain technology. AgroExchange allows manufacturers to sell their products as profitably as possible, in the right place at the right time. A solution fully developed by the AgroExchange team from scratch to meet the specific needs of companies and customers. 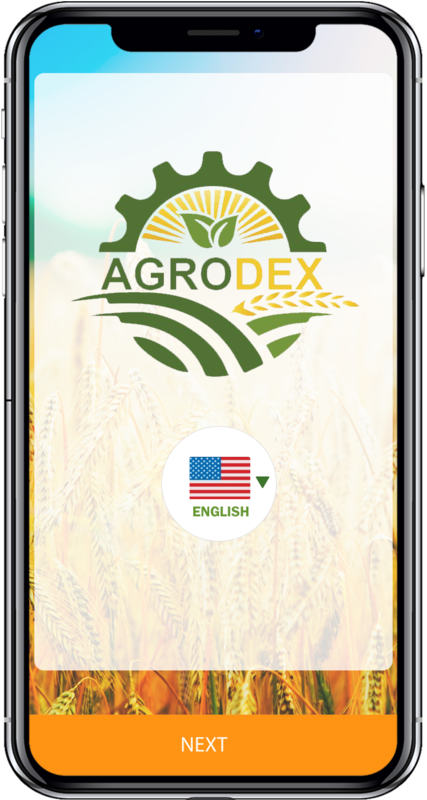 The mobile application AGRODEX allows you to securely, quickly and without the bureaucratic component of a loan secured by agricultural products. The application allows farmers and farmers to token their personal business, because they can be converted into various fiat options and cryptocurrencies. Mobile application “AGRODEX” implements the following functions: – Allows you to find new suppliers and buyers of agricultural products. – Determines the pricing in the agricultural market. – Identifies new needs among agricultural products. Thanks to the system of distributed registers, AGRODEX creates a network of computing, which is characterized by such concepts as security, immutability and democracy. AGRODEX Cloud is a decentralized data storage system. Users have the right to store information and get access to the computing power of decentralized exchange with high network bandwidth for daily use. AGRO transactions are protected by Ethereum Smart Contract, and no one can make a payment on your behalf. Location, currency exchange, lawyers – all this will become unnecessary. Friendly user interface, product reviews and detailed questions and answers. A full-featured, easy-to-use platform available to customers and farmers around the world. A decentralized platform is available for customers and companies with low transaction and operating costs. The blockchain-based trading system makes trading more transparent, and the AI ​​algorithm finds fair market prices in real time.